His Majesty Henry VIII left a mark in history so brightly, as anybody did. Majority remembers about his wives, some keeps in mind Anglican Church, very few are aware of foundation of the Royal Navy, laid by him. 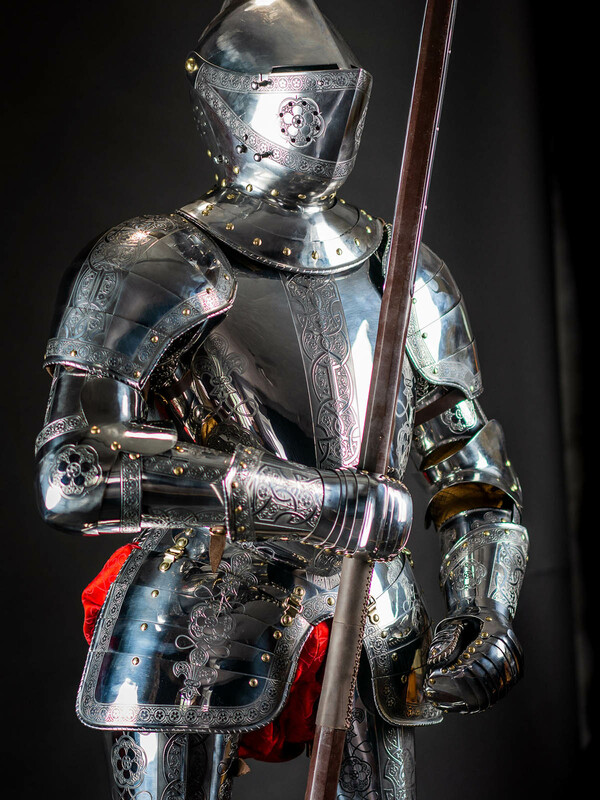 But, quite a few knows that there is Henry VIII to whom we owed the appearance of the Royal Almain Armoury and Greenwich Armours in the 1525 year. 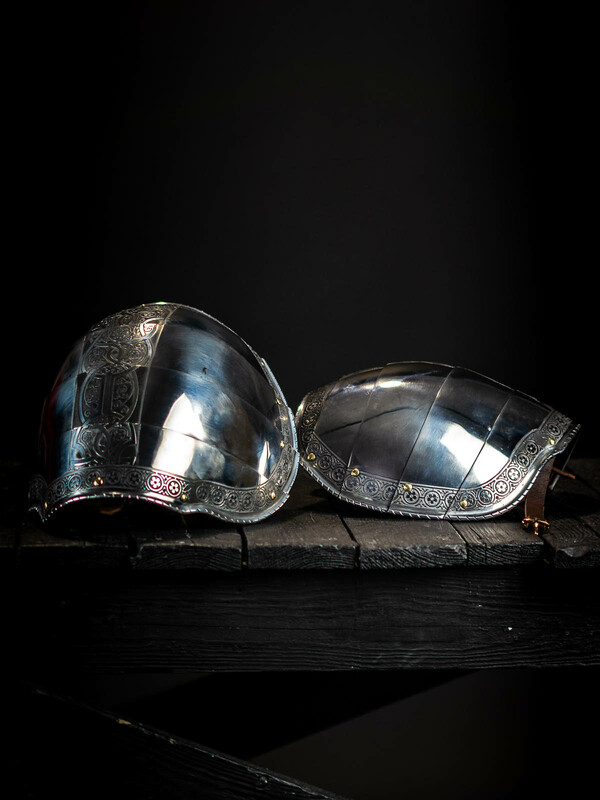 Guest German artisans were creating armor of the singular beauty and quality and teaching English armorers. So, Royal Armoury was developing on the German base and by borrowing some knowledges from other arms schools. There was no lack of orders at Greenwich artisans. They were improving, so Greenwich armour successfully competed with German and Italian armor. Armor Garniture of George Clifford, Third Earl of Cumberland, a masterpiece of Greenwich workshop had been created in the 1590-1592 years. 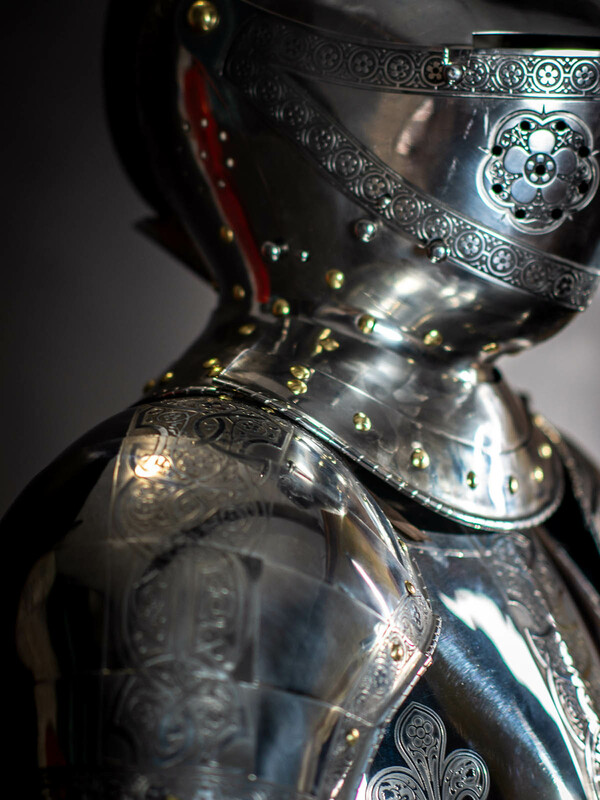 Jacob Halder managed invention of this full medieval armor. He left us not only armor by itself, but also work drawings, which we may see in “Jacobe Album”. 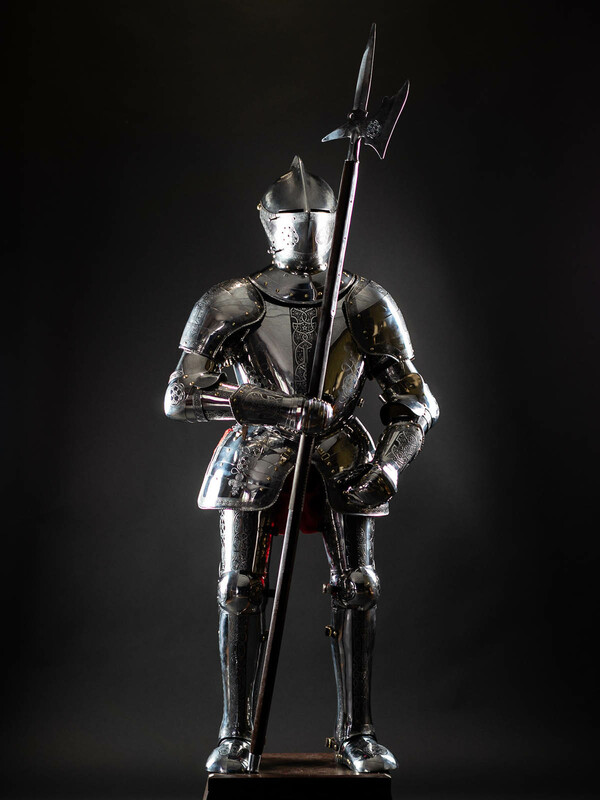 Now, this medieval armor set is kept in The Metropolitan Museum of Art, New York. 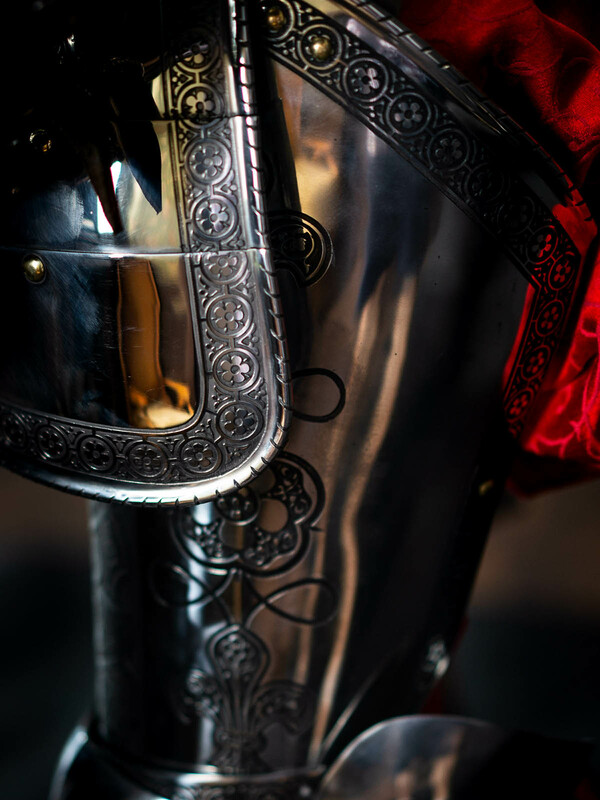 So, when we required sample of real medieval armor, not only beautiful and striking, but also suitable for real medieval fight both on the war and tournament, so we chose Cumberland armor without thinking twice. As this armor is flawless as visually, so functionally. 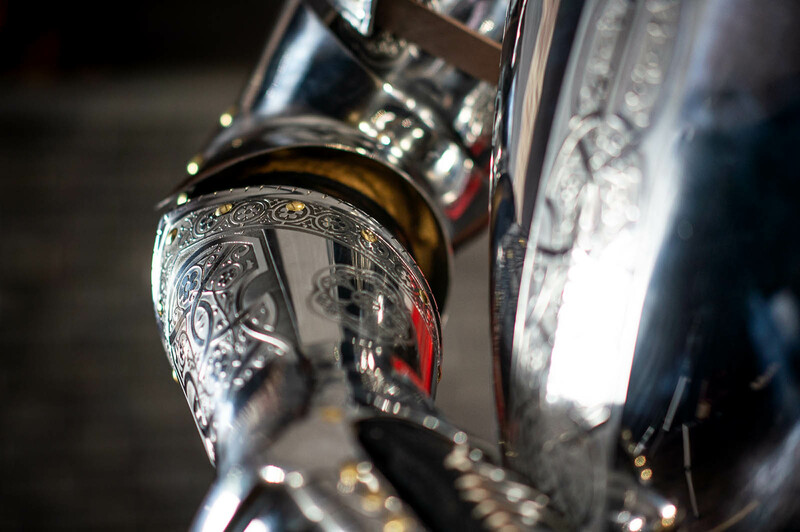 Besides, among all the items from the arsenal of Greenwich workshop, it is best preserved, boggling the imagination up to now. 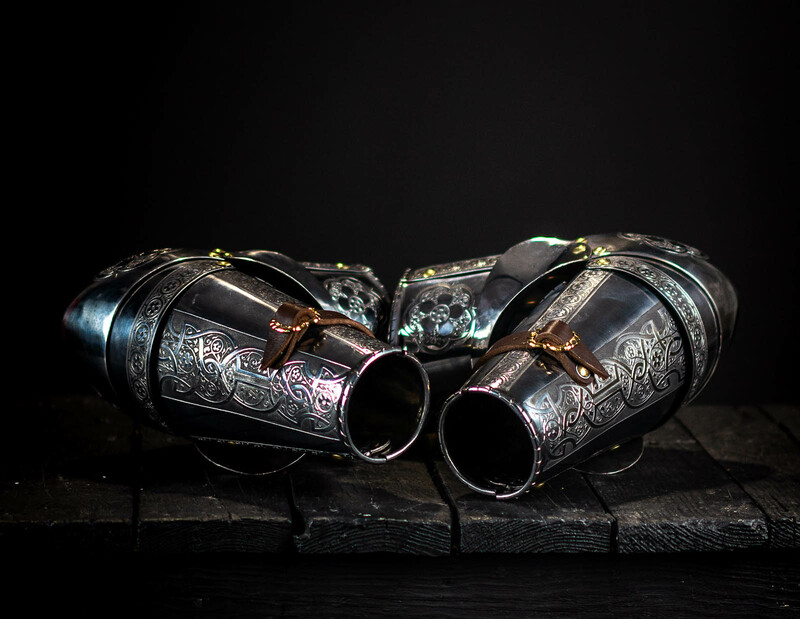 This set is typical one, but the most beautiful representative of the Greenwich workshop, featuring fanciful mix of armor elements from the other workshops. 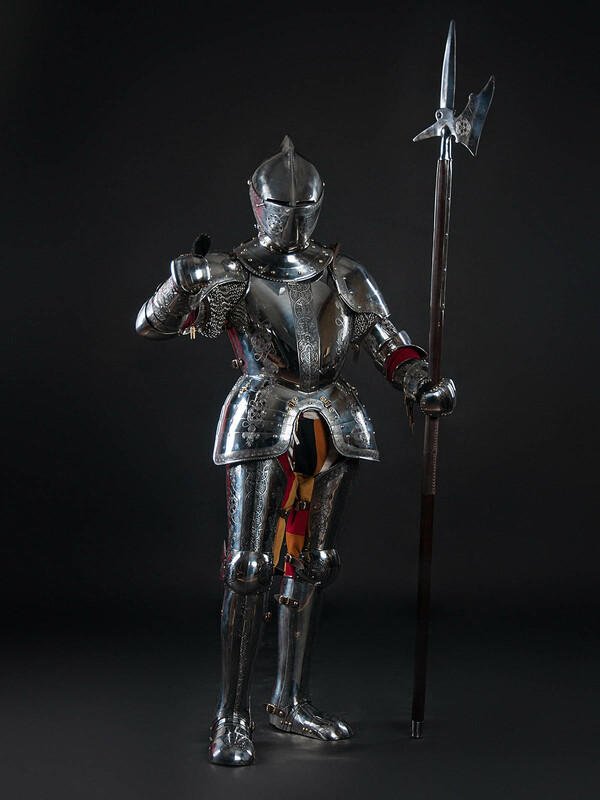 Although German blacksmiths stood at the origins of workshops, the cuirass and spaulders of this set were borrowed from the Italian armor, and helmet is Burgundian armet. Tasses and cuisses were taken from the Low-German and Nurnberg schools, other elements – from Augsburg workshop. Such combination allowed Jacob Halder (and later, Steel Mastery artisans) to create unique battle set, which is light, articulated and well protecting at the same time. 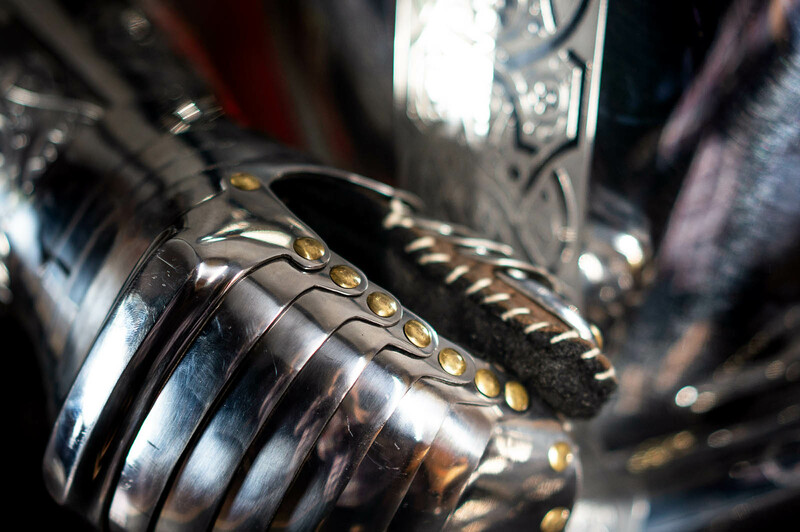 We guess there is one of the best medieval armor to choose. Regarding elements of armor, so knight’s head is protected with late armet with chin plate on hinges and two-part visor. 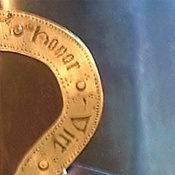 Gorget of two plates protects the neck. Body is covered with cuirass with tasses. Asymmetrical spaulder of five plates are designed as for dismounted, so for mounted battle. Two-leaved plate arms with circular protection are completely shut and do not restrict movements. 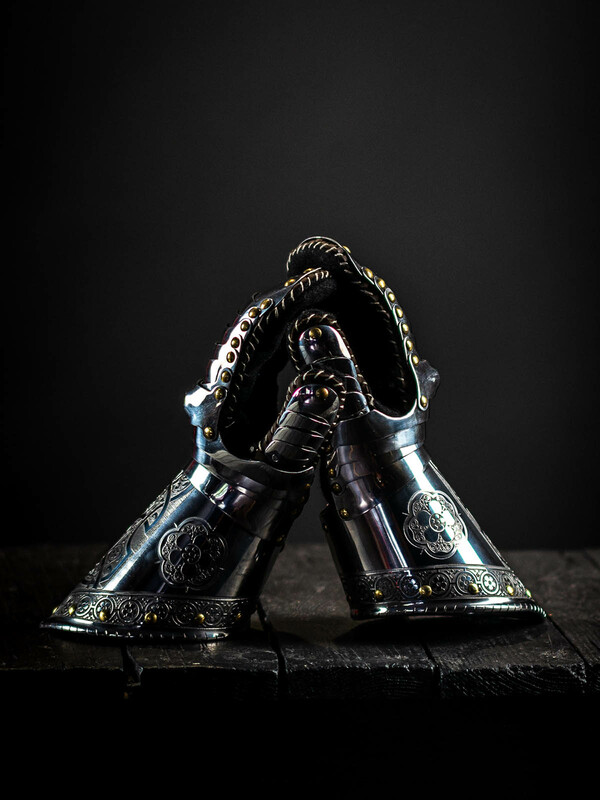 Gauntlets with long pointed cuffs, 13-strips hand protection and scale defense of thumbs continue arms’ protection. 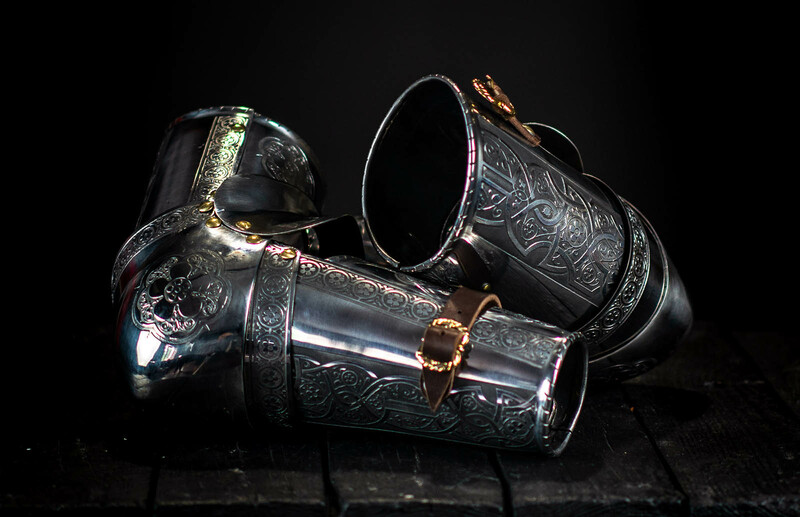 Entire tassets with steel plates pass into two-leaved greaves, which end with sabatons of six plates with not wide and non pointed nose. 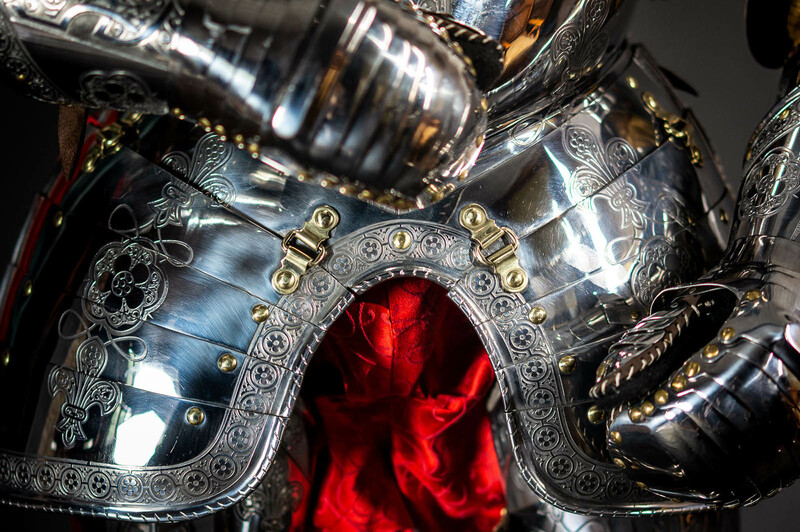 This made-to-measure battle armor is completely handcrafted by our artisans. This model can be moderated as you wish.  Features, which can be modified such as type and thickness of metal, colour of leather straps, additional decoration are specified in options. 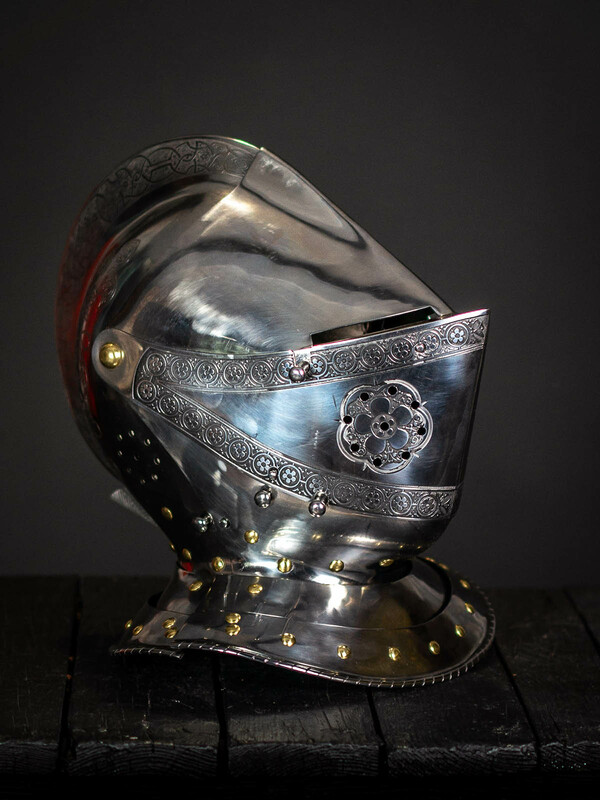 In addition, you can combine various elements of the armor, for example, cuirasses of one type and the helmet of another. You may also like these models of medieval full-plate armour: Milan-style full-plate armor, Classic 15th century knights armor. In section “Full armour”, you can see all models that we offer for ordering. If you didn’t find any for your taste and wish, please send us photo and description of the required model and we will make it for you. Good for any types of fights (HEMA, SCA, etc. ), LARP or stage fights. Diameter of head is 10 mm; diameter of pin is 4.2 mm. There is a stylization of medieval gilded rivet. 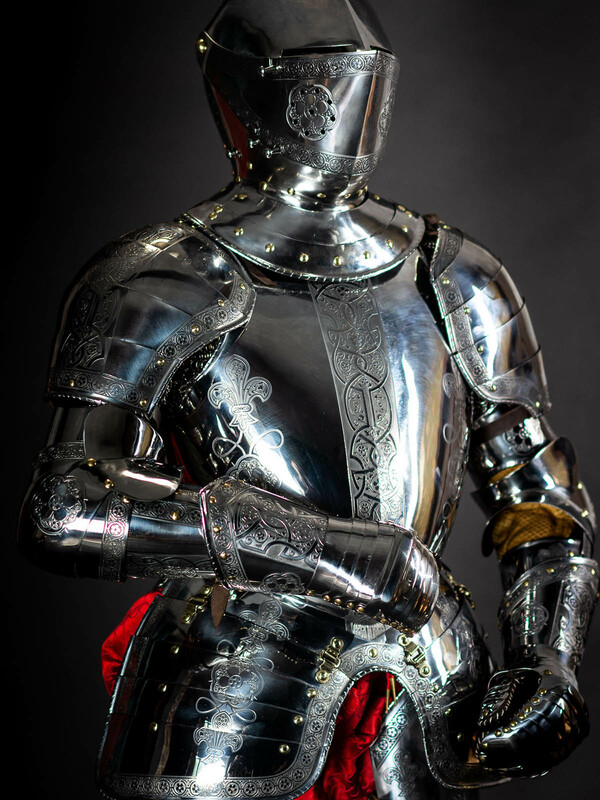 This German full-plate armor if the XV century is a museum replica. 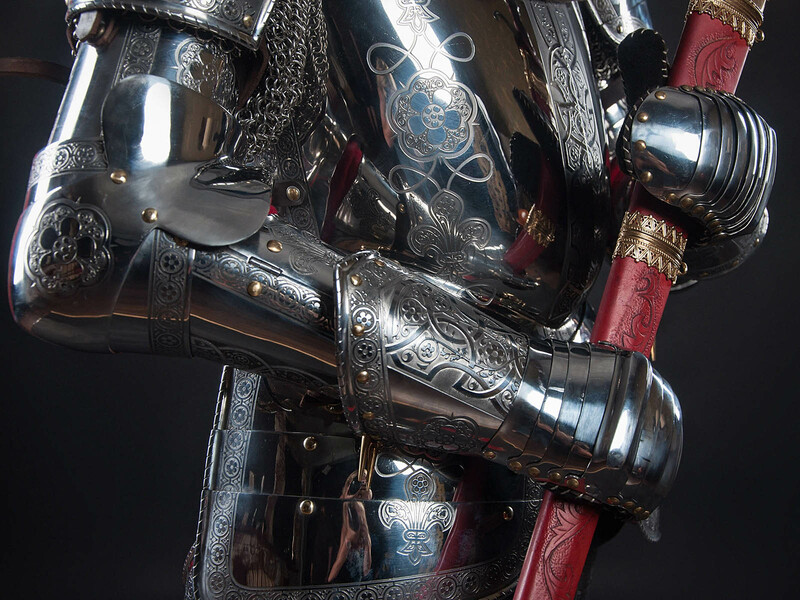 Ribs and sharp shapes are typical for German armor in Gothic style of these times. 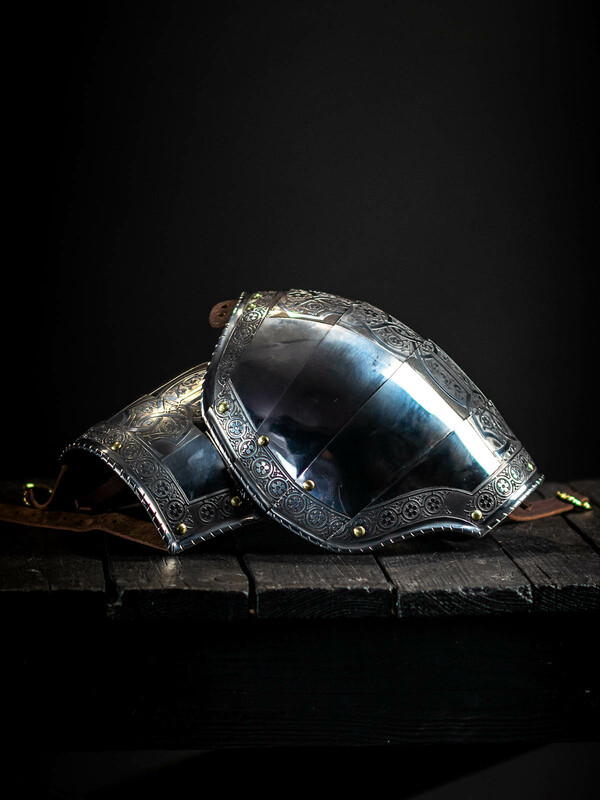 You can use this authentic medieval armor for: SCA HEMA Larp Stage performances Medieval festivals Reenactment events This made-to-measure battle armor is completely handcrafted by our artisans. 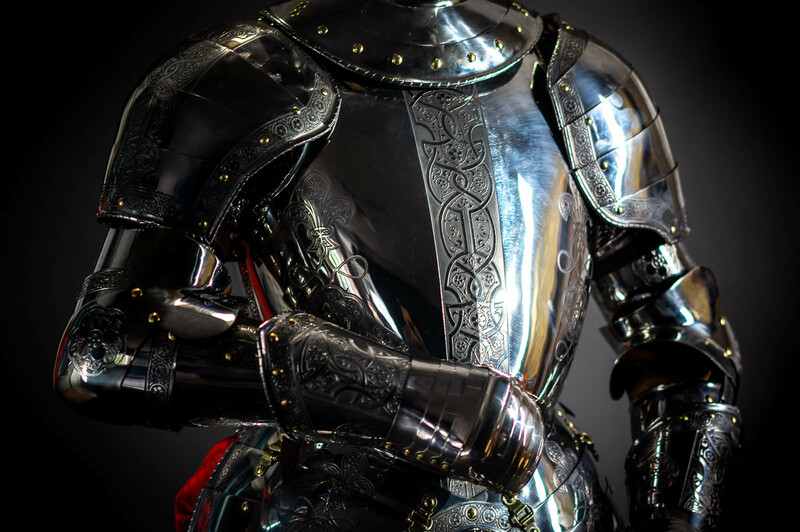 Medieval suit of armor includes the next parts: Helmet Sallet; Cuirass; Spaulders with fluted rondels; Full arm protection; Plate gauntlets; Full leg protection; Closed greaves; Sabatons Surface of body protection is covered with ribs, which are typical feature of Gothic-style armor. 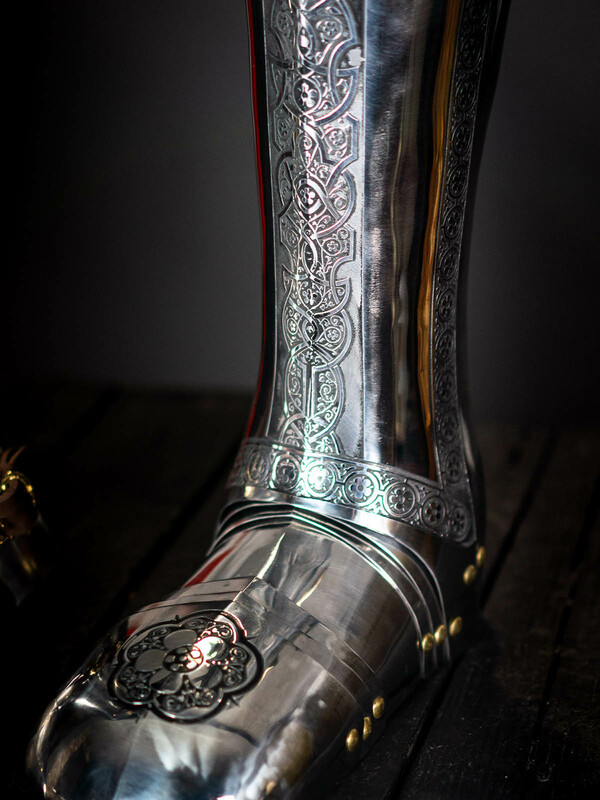 Base price includes following options: Cold-rolled steel 1.0 mm; Satin polishing; Black leather belts; Steel nickel-plated buckles; Steel rivets; No decoration Main photo shows medieval armor with following options: Cold-rolled steel 1.5 mm; Red leather belts; Brass buckles; Brass rivets; Mirror polishing as finish treatment; ..
Gothic armor is a German kind of Milanese type of full-plate armor. It emerged in the second half of the XV century. The armour was very widespread on the territory of the Central Europe. 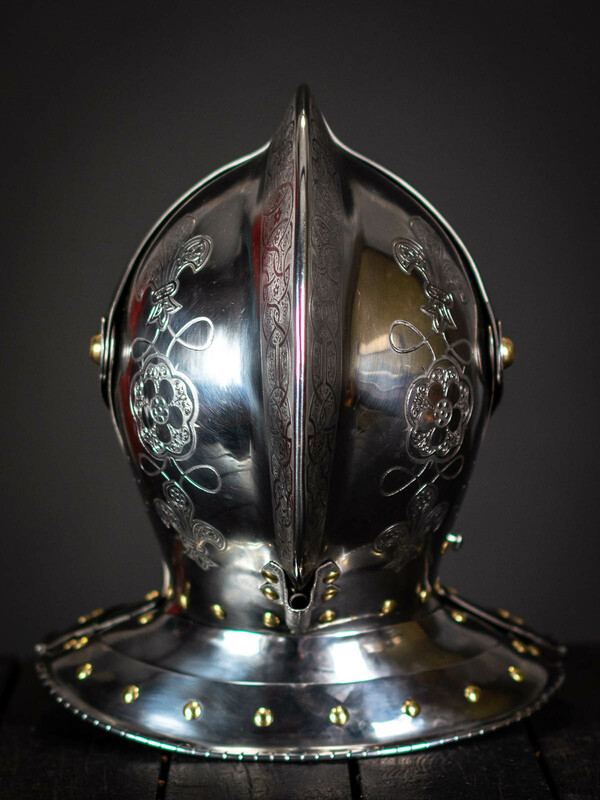 The fact that it was worn by the Holy Roman Emperor Maximilian I added the popularity to the armor. In the name ‘Gothic’ lies the likeness with the architecture of the time: upward trending and oblongness of the forms. 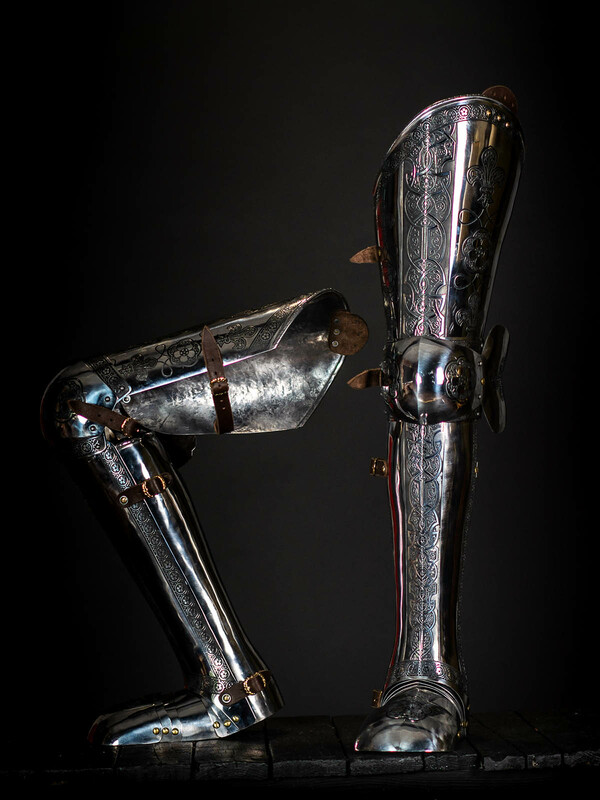 Compared to the original Milanese predecessor, the Gothic armour had several significant improvements. The details were smaller which not only covered the body better but eased the movement of legs and arms as well. The plates were also partly covered with corrugation. This brought an additional barrier of rigidity due to which the armour could stand the attack of the cold arms better. 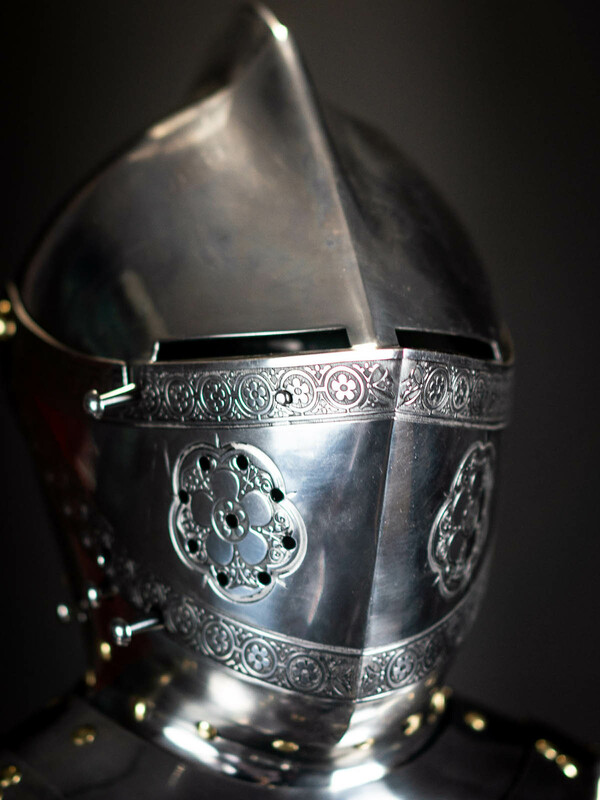 Helmet sallet, which was popular in the Germanic lands, usually used with bevor. One of the distinguishing features was also plate shoes sabatons with pointy tips. Gothic armor could be both with tassets or without them. Plate gloves consiste.. 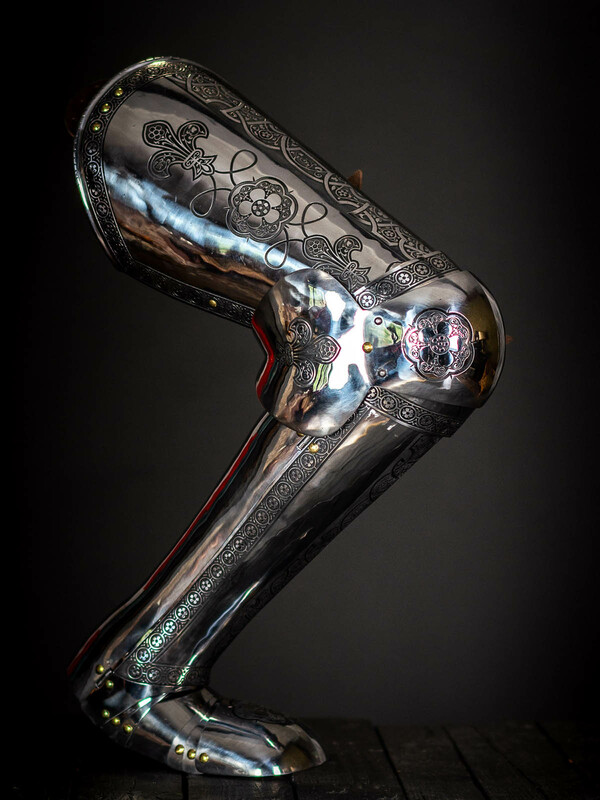 This magnificent piece of the modern medieval armor art will adorn even the most sophisticated interior. The soldier armour made in the style of Italian masters of the XIV century. 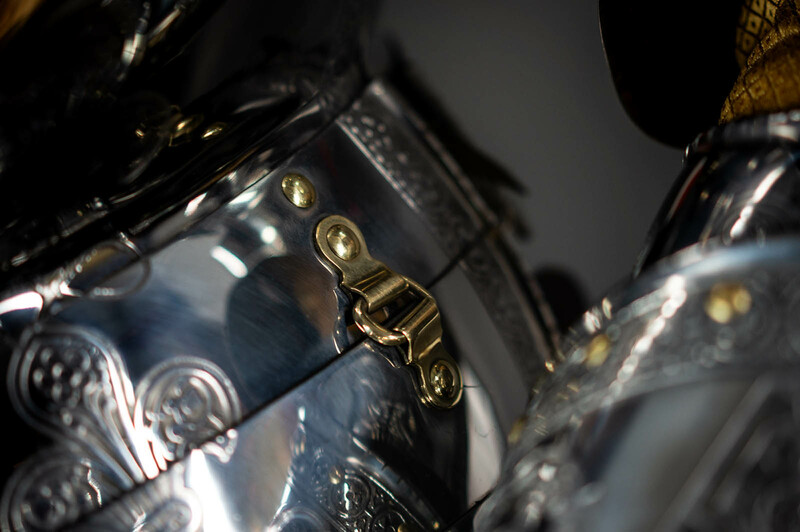 Every part is completely handcrafted by our artisans. This armor is made by standard sizes, not by measurements. 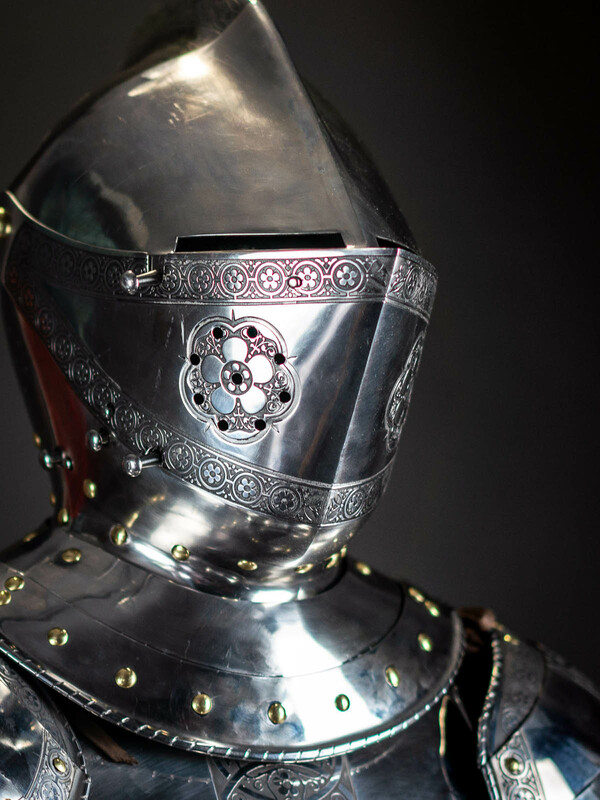 This model of real medieval armor is not intended for battles and tournaments. It can be used only like interior armor. 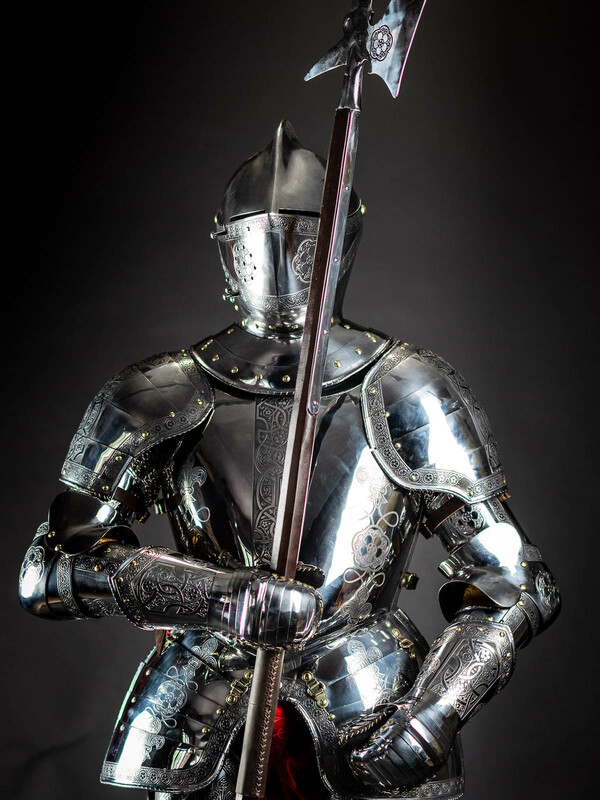 Medieval suit of armor includes the next parts: Closed helmet armet; Plate cuirass with tassets; Pauldrons; Full arm protection; Gauntlets; Full leg protection; Segmented sabatons Base price includes following options: Cold-rolled steel 1.0 mm for all metal parts; Satin polishing; Black leather belts; Steel nickel-plated buckles; Steel rivets; No decoration; Main photo shows full medieval armor with following options: Cold-rolled steel 1.0 mm; Red leather belts; Brass buckles; Brass rivets; Mirror polishing; Plume; Etching This model can b.. 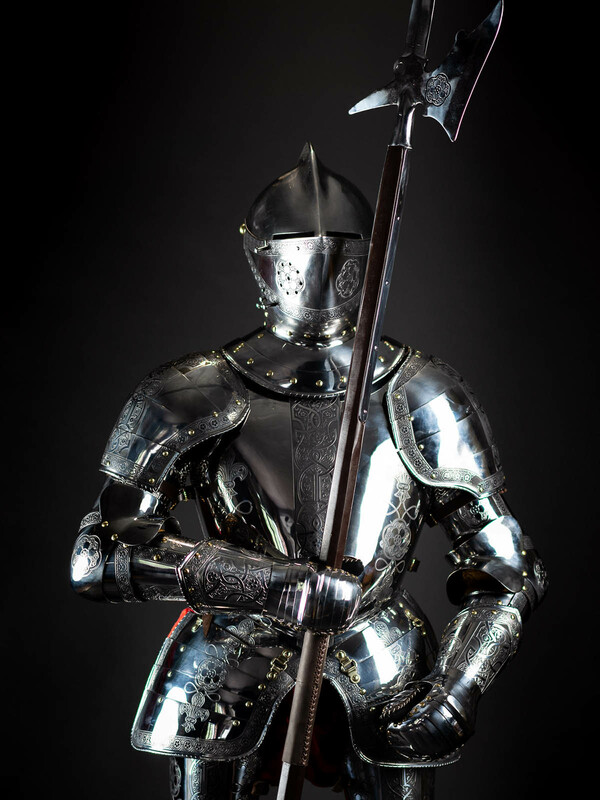 This brigandine kit is perfect armor for medieval fencing or spear running. The kit is not 100% historically correct, but it's appropriate for reenactments of the early XV century. We tested it on the Battle of Nations 2013, where kit showed off the excellent level of protection. You can see the first images of brigandine armour on the Byzantine miniatures. Such type of medieval body armor was widespread among the warriors in the XI-XIV centuries. But in the end of the XIV century, it was forced out by full-plate armor because of armorers' development. 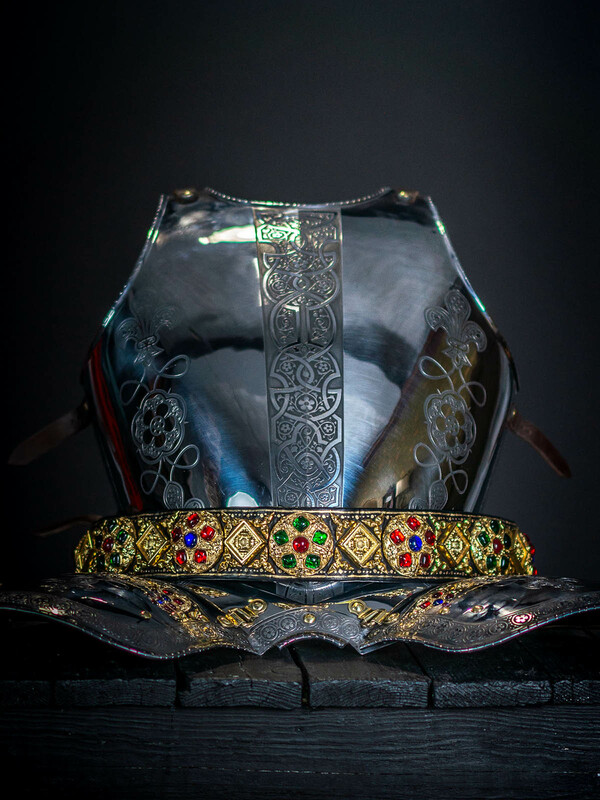 You can use this medieval suit of armor for: SCA HEMA Larp Stage performances Medieval festivals Reenactment events This made-to-measure full brigandine kit is completely handcrafted by our artisans. 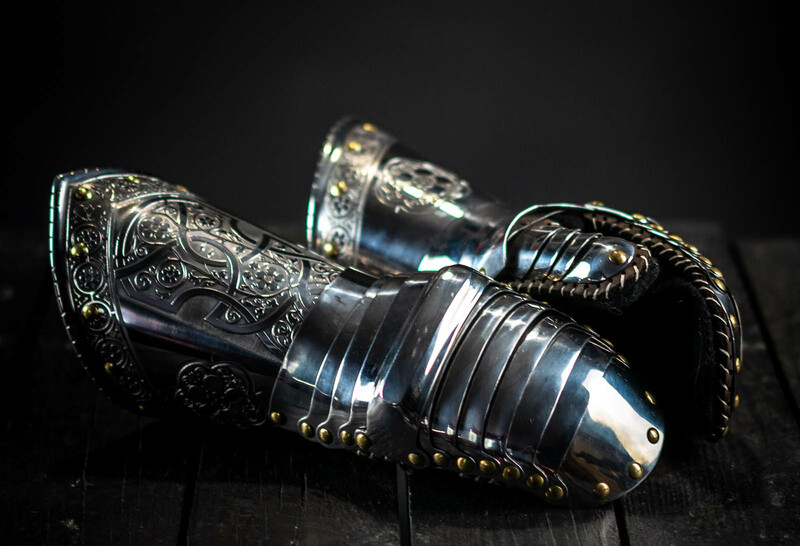 Custom functional armor includes the next parts: Right plate mitten; Left brigandine mitten* Leather brigandine; Brigandine arms; Brigandine tasses; Plate shoulders *We make brigandine mitten for left hand by default. If you hold sh.. Here is extraordinary work for your attention. 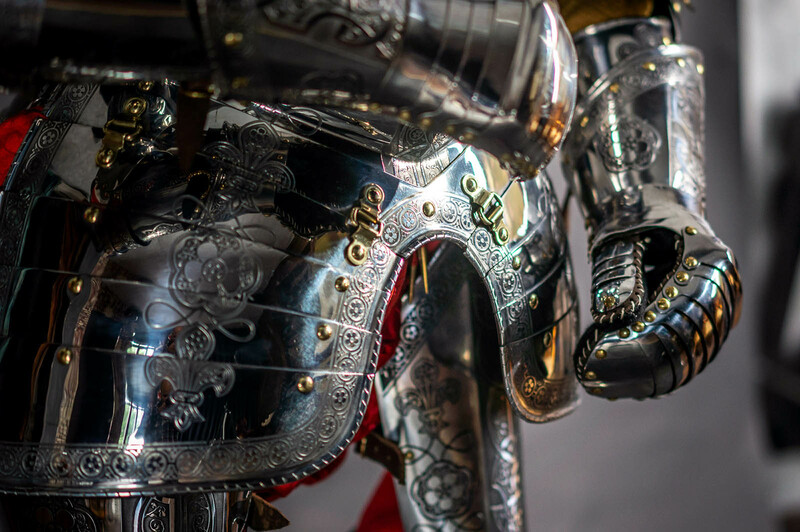 Tournament armor, very heavy, with highest protective qualities and perfectly beautiful. 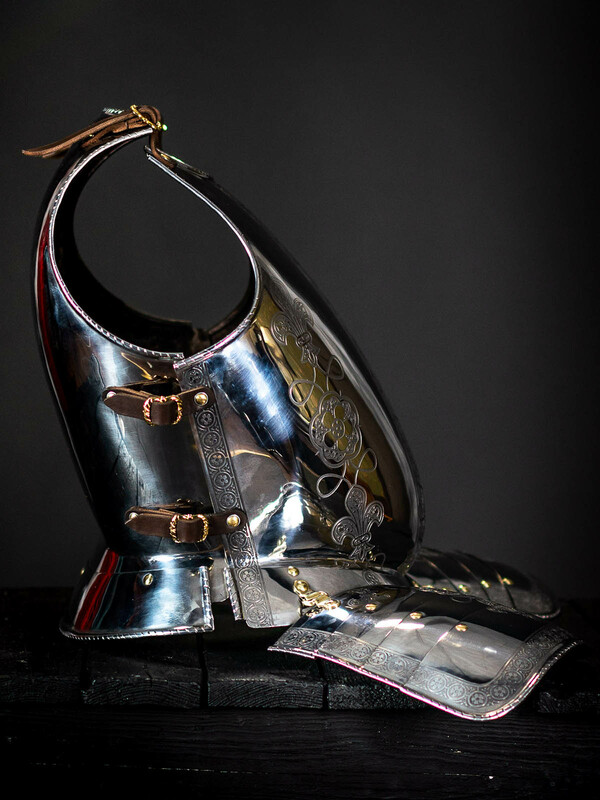 Inspired by tournament outfits of XVI knights (up to Maximilian III of Austria, Archduke of Further Austria and Emperor Maximilian II), Steel Mastery crafted the most precise replica of battle armor of the XV century for you. 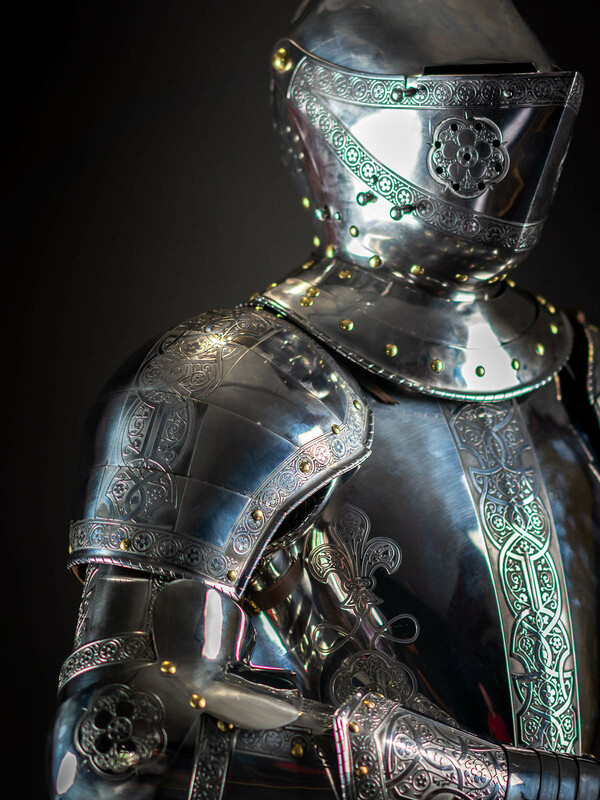 Such armor seems the best medieval full-plate armor of any that had been ever crafted. 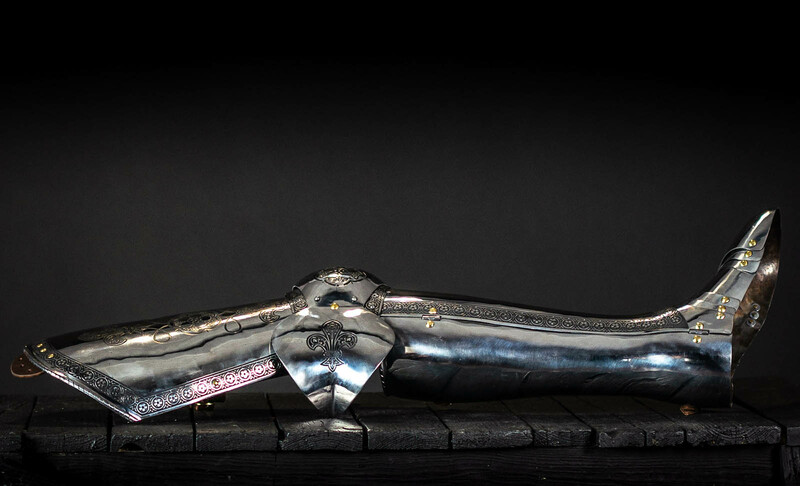 There is state-of-art handicraft of any blacksmith, dignified framing if knight prowess. 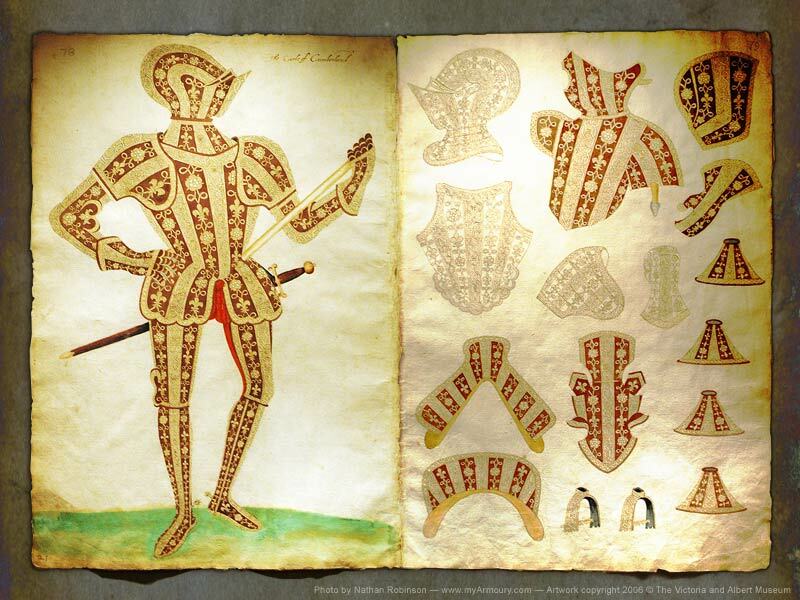 Here you can see sets of armor, which inspired us: Higgins Armory Museum in Worcester Reinforcing pieces for tilt, 1560. 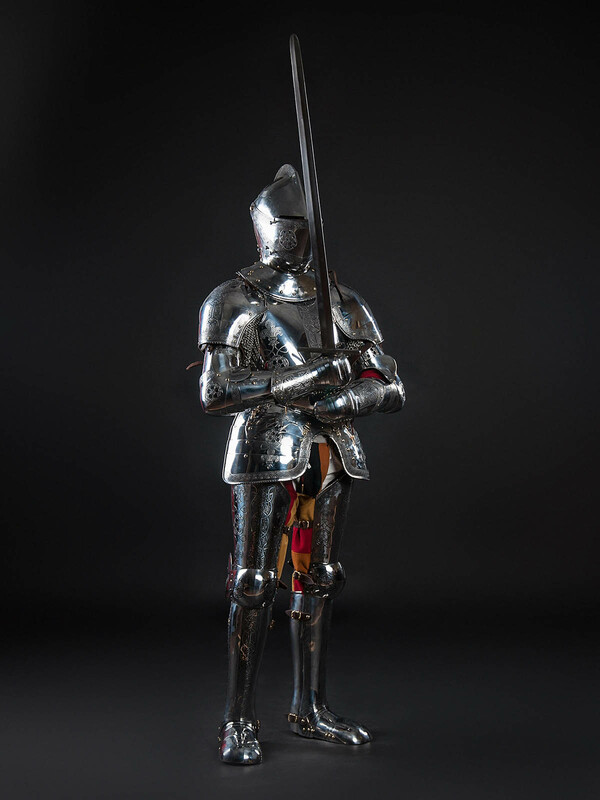 George F. Harding Collection, German, Augsburg Or, armor of George Clifford, Earl of Cumberland, Queen Elizabeth I's tournament champion. 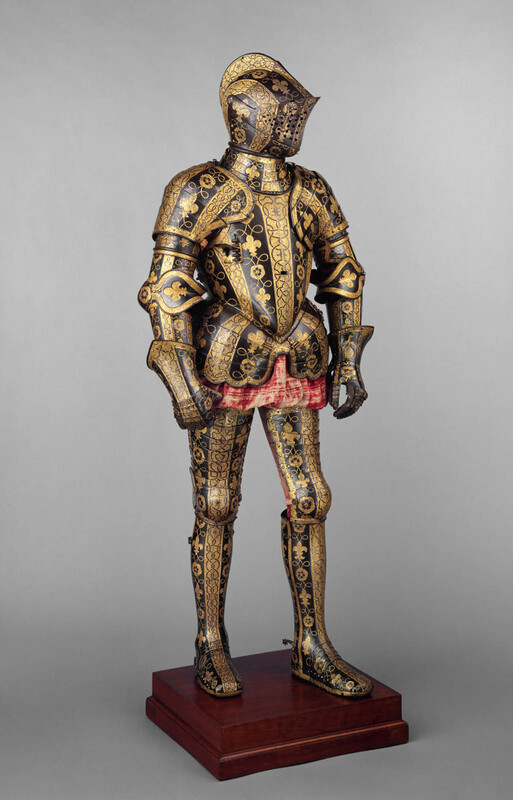 It is kept in Metropolitan Museum of Art, New York: Simple, but classy outfit of Gridded Grand Guard. 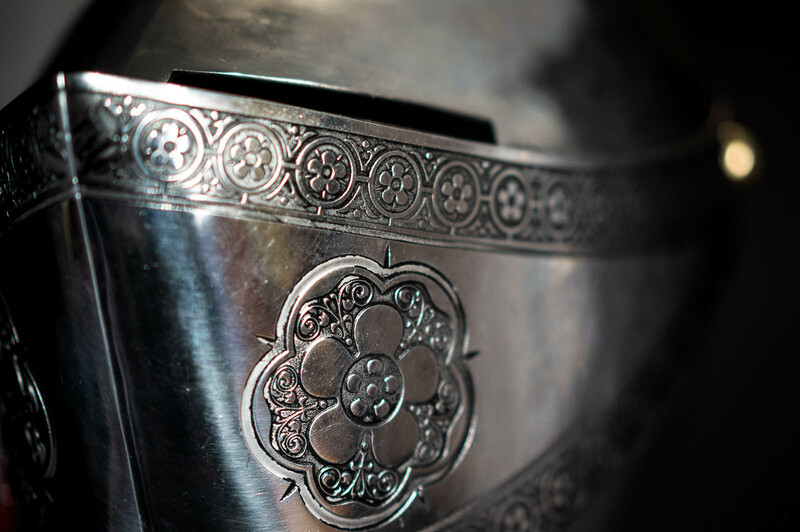 It is kept in Wallace Collection, London: Our tournament set includes cuirass with tassets for..